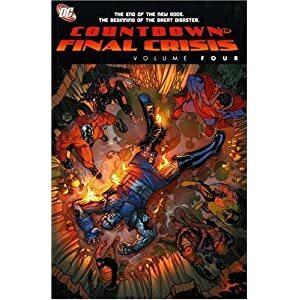 This is the last book in the Countdown series, leading up to Final Crisis. A lot of the plot lines get wrapped up and they set it up for the disturbing Final Crisis. I've heard a lot of people pan Countdown, saying that it wasn't very coherent and not nearly as good as 52. I can't say whether which was better, as I've not yet read 52, but I didn't really have a problem with the series. I didn't find it too confusing, but that could be because I wasn't as familiar with DC as I'd like to be. (Which, honestly, is some of why I'm reading the various DC graphic novels.) I will admit that there were times when I had to go back to remember what had been happening with a certain group. But there were several characters that I found myself really caring about what happened to. There was one character that I really found myself caring about and that was Pied Piper. I hadn't been familiar with him before I read this series, but the once-villain really had me wanting to see him come through this alive. I was glad to see that he played a major part in the conclusion of the series. If you've read the others in the series, you'll definitely want to read this one as well, if for no other reason than to find out how things end. But if you aren't into darker comics, I'd probably suggest staying away from the series.